I love tools. Tools that make life better, work easier, and fun funner. I get a lot of questions about which sewing machines I have, what camera equipment I use, etc. 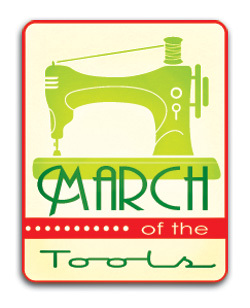 So I started a tradition for the month of March... March of the Tools. Work tools, food tools, sewing tools, whatever tools come to mind, but all tools that I love & use. The parading tools each year will likely include some things silly, some serious and some expensive. No bragging intended, just some dang good tools you might want to know about. I began the tradition in March of 2008 and dozens of other bloggers joined me. 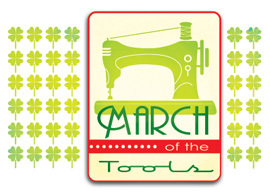 To read through my 2008 March of the Tools posts, click here. To read through the 2009 posts, click here. (Didn't do 2010 - oops.) To read through the 2011 posts, click here. 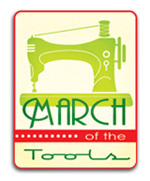 Want to join me on this March of the Tool 2012? I'd sure love the company. And the tool recommendations. If so, here's a badge you can post in your sidebar. Link back to this page so your readers will know what's up. This one is 150 pixels wide, or you can use the 250 pixel one here, or snag the clovered-up version from my sidebar. Send me an email at heather@heatherbailey.com to let me know you're participating and I'll add your link to the list below so we all know who's playing along (you can join us at any time). Then we can all click over to your blog throughout the month to see what sort of tools we're missing out on. And join the March of the Tools Flickr Group (great resource for next year's Christmas shopping ideas, I'm thinking).